This product is not intended to prevent, treat or cure any disease. We are not liable for the mis-use and abuse of the product in any way shape or form. Solvents can be very flammable and should never be used near any open flame! Follow your local state and county rules! 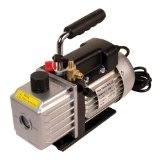 1.Using a 6cfm Purge pump or similar pull a vacuum on the system. 2.Take a spray bottle filled with soapy water and spray around all tape joints and seals. If any spots bubble take note and retape that joint. If any seals leak *make sure they are clean of debris and properly seated. 3. repeat step 1 and2 until no leaks. The LP5 tank must to be chilled below 32degrees! Colder to -4 is better. Start with a layer of Ice. Then sprinkle in some Rock Salt. And add some Dry Ice Chunks. Insert the LP5 Tank. Add more layers of ice, rock salt, and dry ice until you are out of ice. Some towels can be used to trap in the cold. Now with this set-up the Ice will stay frozen for 8-10 hours of working time. *maybe not in direct sunlight on a hot summer day! 1. Attach the Lid with large 8” tri clamp and 8” gasket. *make sure the gasket is properly seated, you can reach in the top of the 4” opening to help push the gasket into posiston on the inside! 2. Insert gasket seal for the tower.Place the tube. Secure it in place with a clamp and Fill the tube with your desired material. Packing it as you go. Medium packed is Good! *don’t over pack it and smash it down as hard as you can you may rip the screen!! Insert gasket seal for the top. Place the top and attach with a clamp. The Extractor is ready to be hooked up to the Re-Claim System. · 3- ¼” sae female flare or jic color coded 60” hoses (red, yellow, and blue) or 3-SS302 staineless steel braided hoses. both kinds are ptfe lined! 1. First the 6cfm purge pump is applied to get the collection tank of the extractor down to -30hg the max allowed in space. 2. When -30hg is reached close the lower port disconnect the 6cfm purge pump. 3. Then hook up the TR-21 vacuum recovery pump. Starting With one Hose Connect it from the Out port of the TR-21 Vacuum recovery (collection) pump to the Vapor side of the LP5 tank. Then one Hose connects from the Liquid side of the LP5 tank to the Top of the tower (upper port). Then one Hose connects from the extractors lower port to the TR-21 Vacuum collection pump IN port. Hose Connections are now complete and you are ready to start running! 5. open both handles of the extractor. Upper and lower ports open. 6. Handles in an up down vertical posistion are open. Handles in a horizontal side to side position are closed. 7. Open the Vapor handle on the LP5 Butane Tank this is where the butane gas gets collected back into. Now you are ready to turn the gas on. 8. Turn on the Liquid handle and the The solvent is now flowing over the material in the tube and the Tube will begin frosting over from the top on down to the bottom. Watching the pressure gauge is your main job! 9. You will see the pressure start to rise back up from the -30hg we purged it to. 10. Leave the valve open until you get to +15psi. then throttle back to achieve Equilibrium where the vacuum collection pump is sucking out as much as the tank liquid is putting in. Adjust the liquid valve so it reads a constant +10-15psi on gauge. *If you have a sight glass you can watch the color change as the liquid flows past the glass. At first it will be golden and frothy like a beer, then it will go clear and that is when you know to shut the liquid handle off. *Otherwise you can do it by time elapsed It only takes 30-45 seconds of the valve being on to do a full wash cycle of a tube. 11. If it reaches 30 PSI turn the Liquid side of the LP5 tank off! Let the pressure come back down so that a constant psi of 10 -15psi is achieved. 12. After it runs clear or you have decided enough time lapsed shut off the liquid valve. 13. The vacuum pump goes to work re-claiming the butane into the LP5 Tank! *When the psi gets down to 0-5psi it slows down. 14. close the upper port, and disconnect the upper port hose. The Extractor should be set in and then out of a hot water bath (120degrees) max. Turning the liquid back into a gas with this in and out method speeds up recovery time! 18. When the meter no longer gets positive pressure with the warm water bath applied. Gauge stays negative pressure. 19. then you are ready for the Final purge. You now disconnect the TR-21 Collection pump and hook up the 6cfm purge pump in its place..
20. When shutting off the vacuum recovery pump first close the lower port and Wait a little while for the vacuum pump to clear out. 21. Then shut down the vacuum collection pump. 22. Now disconnect the TR-21 vacuum Collection pump and hook up the 6cfm purge pump. 23. The 6cfm purge pump is applied to get the vacuum tank down to -30hg. 24. *if you want a pourable product don’t purge as much stop at -10hg. 25. Close the lower port handle and disconnect its hose. Leaving the collection tank vacuum sealed tight at -25 to -30hg. 26. The vessel can then be placed back in the warm water bath to cure. The longer you leave it vacuumed the harder the product will be. 27. The Hot water bath mimics what a vacuum purge oven is doing, although the oven can hold a more precise temp. this method works! The difference in the temperature affects how the end product will look. Experiment find what you like best. 28. Open the lower port handle and listen to the extractor whistle as the air rushes back into the tank. I think it sounds awesome! 1. Open the lid to the extractor. 2. Using a Scraper Collect the Contents onto a Silicone Pad! 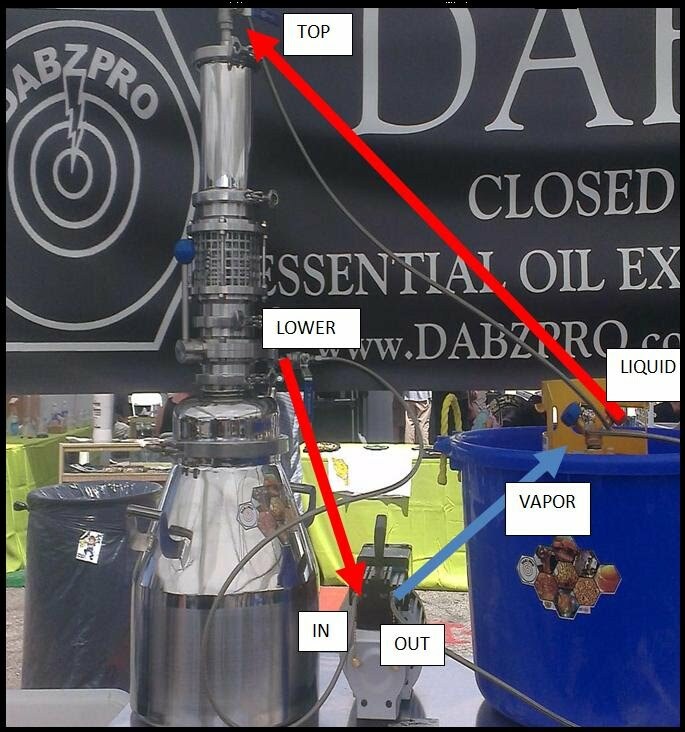 This is how you make essential oil concentrates! This product can then be put into a vacuum oven to changes its consistency. Just like sugar the Temperature it is heated to will change its structure. From caramel to taffy to suckers.